This surf and turf recipe is an ode to Karen's travels in Canada, where abundant seafood is often found alongside the country's fantastic farm produce. When I was in Newfoundland and Nova Scotia a couple of years ago, I was overwhelmed with the quality and abundance of fresh seafood, namely lobsters, scallops and prawns, in particular beautiful plump spot prawns. I have to admit to being a bit of a shellfish glutton, and enjoyed what the provinces has to offer from the seas in nearly every meal. As well as delicious seafood, I was also lucky enough to eat some wonderful Canadian beef too, with locally grown vegetables – although Canadian food is hard to define, I would say that its style is very much along the lines of the 'Farm to Table' movement, with provenance and locally sourced seasonal produce being at the fore of modern Canadian cuisine. With that in mind, this recipe shows off Canada as a hotspot for travelling (and non-travelling!) foodies. It's a classic dish of surf and turf, but brought right up to date with a few tasty twists. 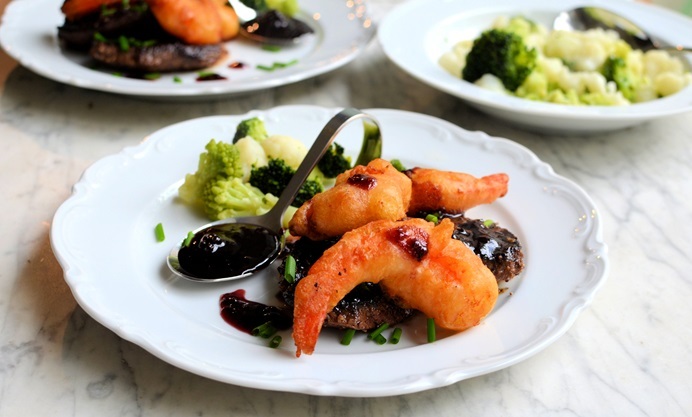 I used cold water king prawns, as the beautiful Canadian spot prawns that inspired this recipe can be tricky to source in the UK. 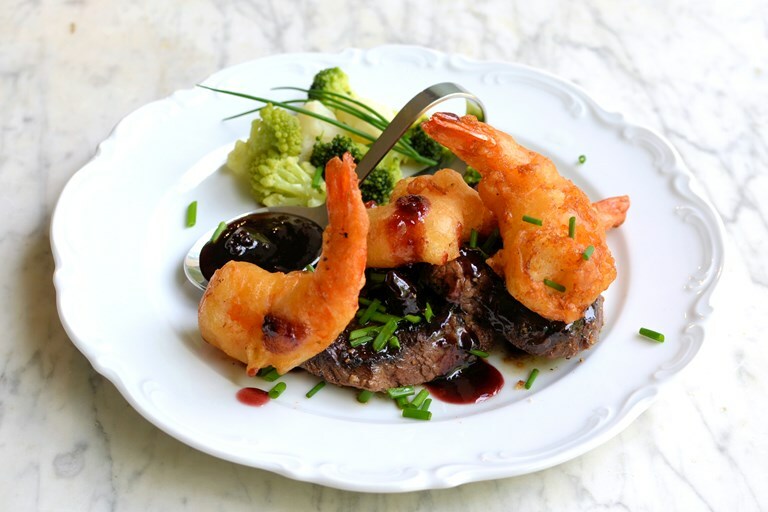 The prawns are given the tempura treatment, served with a broiled filet mignon and a sauce of berries with Canadian ice wine.